It is hard to find the “perfect vacuum.” If it works well it is often to expensive for the average consumer. Those affordable vacuum cleaners often fail to provide the suction, power and conveniences that make cleaning a little more pleasurable. These things are no longer true thanks to the invention of the Hoover Tempo Widepath upright vacuum cleaner. After many hours of research, reading reviews from consumers and reporting agencies and trying it for myself, I have determined that this upright vacuum cleaner cannot be beaten. What’s So Great About The Hoover Tempo? Using the Tempo cuts your cleaning time in half. 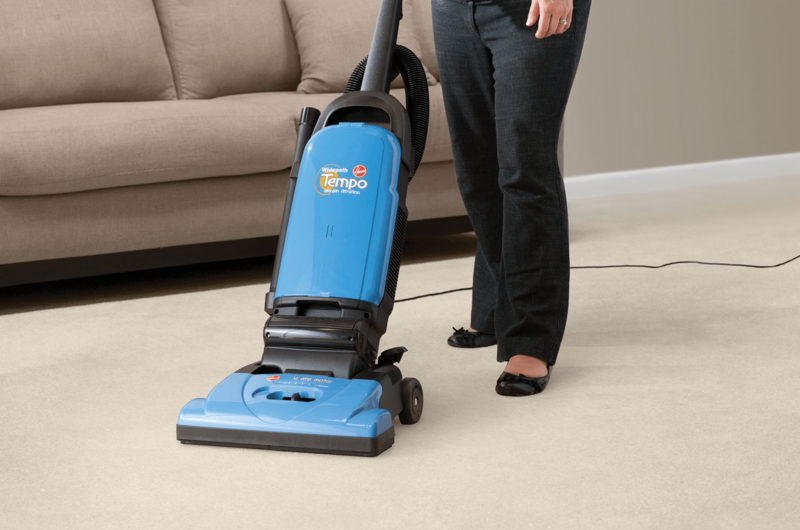 With a 15 inches cleaning path, you can cover twice the space in far less time when using the Tempo. There is also a 25 inch extended reach power cord and triple surface height adjustment feature that allow you to clean without stopping. It takes just one turn of the button to go from cleaning bare floors to carpets. When cleaning time matters the Hoover Tempo proves that you can get the job done in a quick amount of time. It is simply amazing how easy it ease to get the entire home cleaned when using this special vacuum cleaner. If you suffer from allergies choosing a vacuum cleaner that prevents airborne particles and dust to build is important to own. The Hoover Tempo features an anti-allergen filtration system that traps as much as 99% of dust and pollens as small as 5 microns. This is something all allergy sufferers will be able to appreciate. Even those without allergies can find a better air quality inside of their home with the use of this cleaner. It truly benefits everyone who owns it! The Hoover Tempo is an all-in-one cleaning system. Not only do you get the Tempo vacuum cleaner you also get 2 extension wands, a crevice tool, an upholstery tool and a surface dusting brush. You can easily clean the carpet, bare floors, the sofa, curtains and upholstery without ever having to buy anything extra. The Tempo truly is a complete cleaning system that saves both time and money. There is an off/on button that makes it easy to use your machine without hassle. And, with the ability to adjust the Hoover Tempo in five different settings, you can ensure that the proper height, as well as cleaning level is established using this cleaner. At just 17 pounds the Hoover Tempo is a lightweight vacuum cleaner than can easily move from room to room with ease. No matter who you are the Tempo can clean the entire home and be moved with ease. It features a slim design so that storage is easy in addition to the lightweight design. The onboard storage tool makes it easy to keep track of the attachments included with the Hoover tempo. Those attachments include a dusting brush, furniture nozzle, crevice tool and two different extension wands. How Much Does The Hoover Tempo Windpath Upright Vacuum Cleaner Cost? One of the best features of the Hoover Tempo is its affordable price. For a vacuum cleaner offering so much you would probably expect to spend hundreds of dollars. But this is not the case with the Tempo vacuum cleaner. You should never pay more than $70 for this cleaner. And, when you place your order at Amazon you will get the best price in addition to free shipping, a deal that you cannot pass up! Is There A Warranty With The Hoover Tempo Widepath Upright Vacuum Cleaner? With the purchase of the Hoover tempo you will receive a one-year warranty. This one-year warranty provides protection against parts and labor defects. Should the vacuum fail to meet your expectations you can return it for repair or replacement. Ensure that you complete the registration card upon receiving the cleaner to ensure that you can take advantage of the warranty should the need arise. What Are Others Saying About The Hoover Tempo Widepath Upright Vacuum Cleaner? Customers agree that the Hoover Tempo is one amazing machine. Of more than 2,000 Amazon reviews, most of those are positive. The Tempo received a 4.1 out of 5 stars on Amazon. Check out a few of the things that users of the Tempo had to say. If you would like to see for yourself what others are saying, go ahead and click here. There are plenty of great reviews of the Hoover Tempo that will help you learn why we think this is the best vacuum cleaner out there. When so many all agree you know that you are getting a vacuum that really performs like it is supposed to. The benefits of the Hoover Tempo Widepath Upright vacuum cleaner are pretty amazing, wouldn’t you agree? If you are just as impressed as the others, now is the time to make this vacuum cleaner your own. Click here and you’ll go directly to Amazon where you can make your purchase. Amazon has the lowest price I’ve seen for the Hoover Tempo Widepath Upright vacuum cleaner. Along with the best price Amazon offers free shipping for the vacuum, a deal that equals tremendous savings.